Keeping in contact with your clients is important no matter what business you are in, but especially so in the services industry. Whether your bottom line meets your monthly goal or falls short often depends upon how much “face time” you have with your clients, or how effective your branding and name recognition is. Obviously, the goal is to establish and maintain contact without annoying your customers with repeated calls. Enter e-mail marketing. We’ve all heard about market share, but what about “mind share”? E-mail marketing is just one of the services that The Web Guys offers that can take the stress and enormous time commitment out of contacting your past and present clients, while still getting your name in front of your customers. 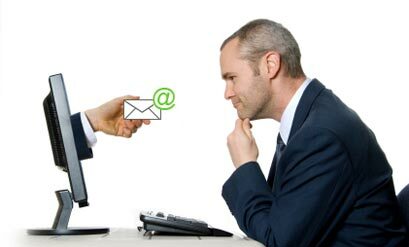 Email marketing is a versatile communication strategy, customizable to your business. The core idea is to make sure you are front of mind, and that you retain some form of “mind share” when your past clients or people you’ve quoted in the past are thinking of having some work done. Let’s take a look at how it works for one our clients, Rob and Kathi Booher of Booher Building Company, Inc., in Indianapolis. Rob and Kathi wanted a noninvasive, friendly way of staying in touch with all their clients—past, present and future. As Kathi told us recently, the Boohers would often do estimates for people, and then continually follow up on those estimates, calling every three to four weeks—a protocol the Boohers quickly tired of, as did their clients. They knew that eventually the homeowners would have the work done, but they just weren’t ready yet. The dilemma was how to keep the Boohers’ name in front of their clients without annoying them. An e-mail marketing newsletter has been the perfect solution for Booher Building Company. Several times a year, The Web Guys e-mail a newsletter to all the people on the Booher’s mailing list with a newsletter we’ve put together for them. It’s been a very effective communication tool. “E-mail marketing has been very successful for us,” Kathi says. “It works for us in that it reaches out to our customers and puts a bug in their ear, that we’re still here, still doing projects, and our customers are satisfied with the work we’ve done for them—without us actually calling them every three or four weeks and driving them (and ourselves) crazy,” she said. A feature story on a recently finished home renovation, complete with photos and valuable links to their website. A primary focus on a service they offer (rotating these each issue), especially useful because customersoften forget or aren’t aware of all the different services that their business offers. Tips and trends in the market their customers will be interested in. A discount coupon to try and motivate their customers to act sooner, rather than later. And as for the results, the Boohers have already generated business from the newsletters. One client who had used Booher Building for a previous project was getting ready to move several months later when she received a newsletter in her inbox. It was well-timed, because she needed to have some repair work done before she put her house on the market. Lest you fear that e-mail marketing is going to demand tons of your already non-existent time, Kathi would be the first to tell you that it’s a very hands-off process for them. “I don’t feel burdened at all,” she said. The Web Guys make it very convenient. They’re flexible and always do a good job. They handle it for us and make it happen,” she said. If you’d like to talk to us about how an e-mail marketing campaign can benefit your business by building your brand and keeping your name and phone number “front of mind;” or if you’d like more info about website design or search marketing, call The Web Guys Phone Number at 317-805-4933.